Despite being dominated by the Denver Broncos defense for much of Super Bowl 50, Cam Newton still had a chance to give his Carolina Panthers the lead with just over four minutes left and down 16-10. But then something strange happened. Much like he&apos;d done all game long, Von Miller sped into the backfield on 3rd down, stripping Cam of the football just as he was cocking back to launch a pass downfield. The ball fell to the turf, but instead of getting on the ground and diving for it, he just kind of looked at it before taking a step back. 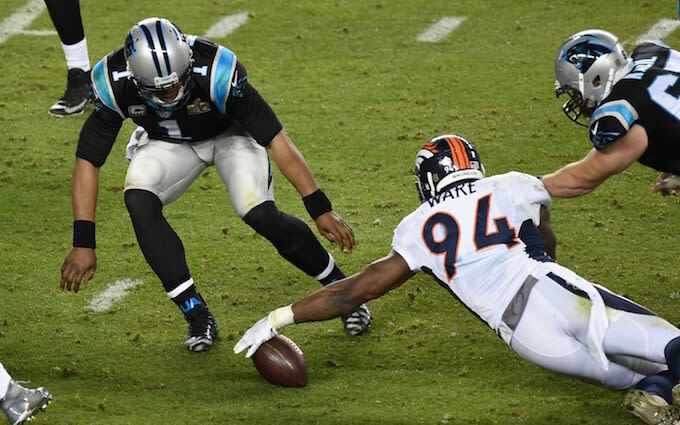 DeMarcus Ware recovered the ball, and the Broncos scored a few players later, essentially putting the game out of reach, Twitter went bananas, with may scratching their head and blasting Cam for not diving to grab the lose ball and play another down. Cleveland Browns safety Donte Whitner came strong. Well, Cam. It was fun while it all lasted.